What can we offer our young people? They can learn to play the instrument or improve their standard under the individual, or small group, tuition of talented, and usually qualified teachers, and they will be introduced to a wide range of music (as outlined in our Music page). They will have the pleasure of away days - always well supervised. These will be concerts or contests and may include an overnight stay in another country (wholly optional) If they don't already own their own instrument (and that could be a timpani, glockenspiel or a sidedrum), we will provide one of quality. They will have the opportunity (again wholly optional) to play with one of the world's finest marching flute bands. 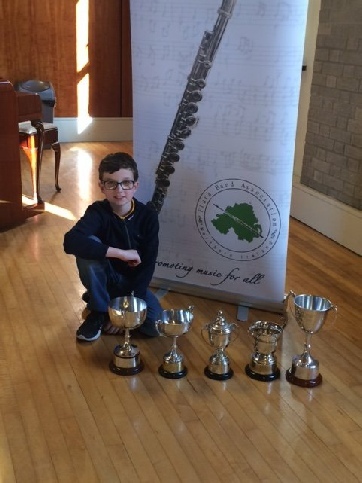 At the 2018 Flute Band Association’s Solos & Small Ensemble Contest, Harry Douglas added to his impressive performance in 2017 by winning both the under-13 and under-16 G Treble and Concert flute sections. He also had the best overall performance in the solo flute sections. Congratulations also to Rebecca Gourley who was runner-up in both the under-10 and under-13 concert flute sections. And congratulations to Percussionist Matthew Gourley for winning the novice side drum section, and to Andy Robinson who finished equal second. 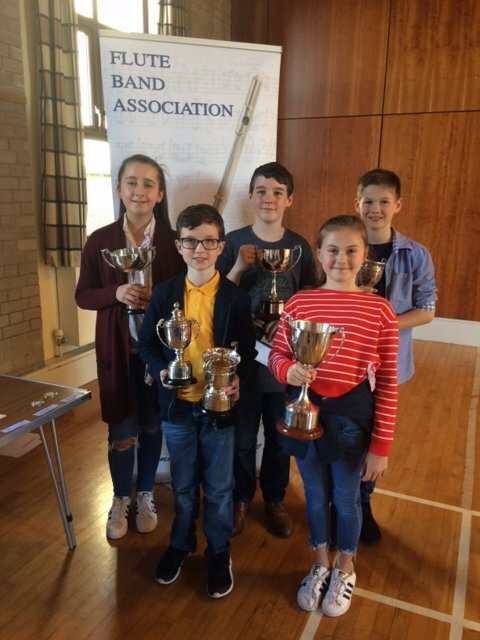 Pictured (from left) are Rebecca Thompson, Harry Douglas and Matthew Gourley from Ballygowan, and Karen Gilmore and Joseph Barr from Cahard (winners of the under-21 duet). Ballygowan also won the Magill Trophy for the Best Band of the day. Another good day at the office as the Band brings home two trophies from the 2017 Scottish Spring Contest. Rebecca Thompson and James Douglas display the trophies. Sam Robinson plays in his first contest (May 2017) & has a trophy to show for it. Harry Douglas wins the Under-13 G Treble Solo at the 2017 Flute Band Association Solos & Small Ensemble Competition .He also finished runner up in the Under-13 Concert Solo - repeating last year’s result, and he finished second in the Under-16 Concert section. Proud of you, Harry! 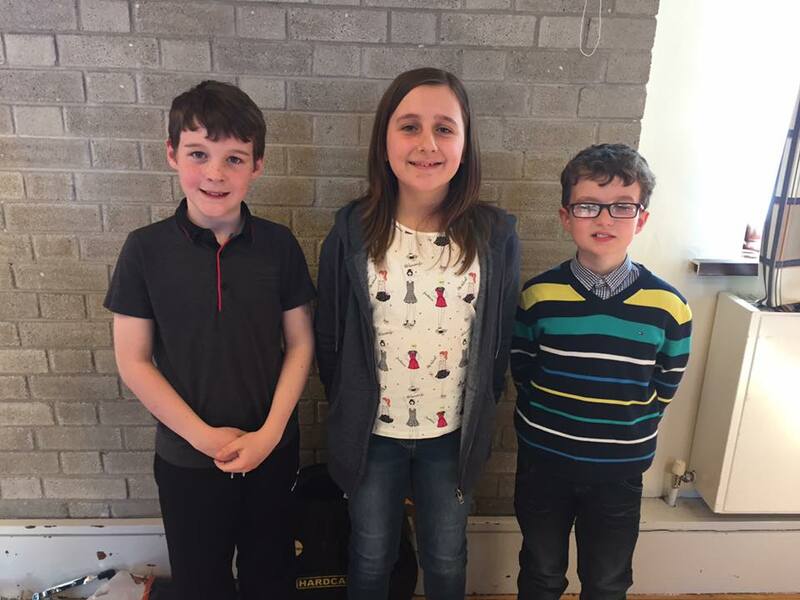 Well done to our young flautists and drummer who took part in the Flute Bands Association Solos and Small Ensembles Competition in Newtownards on Saturday 23rd April 2016. 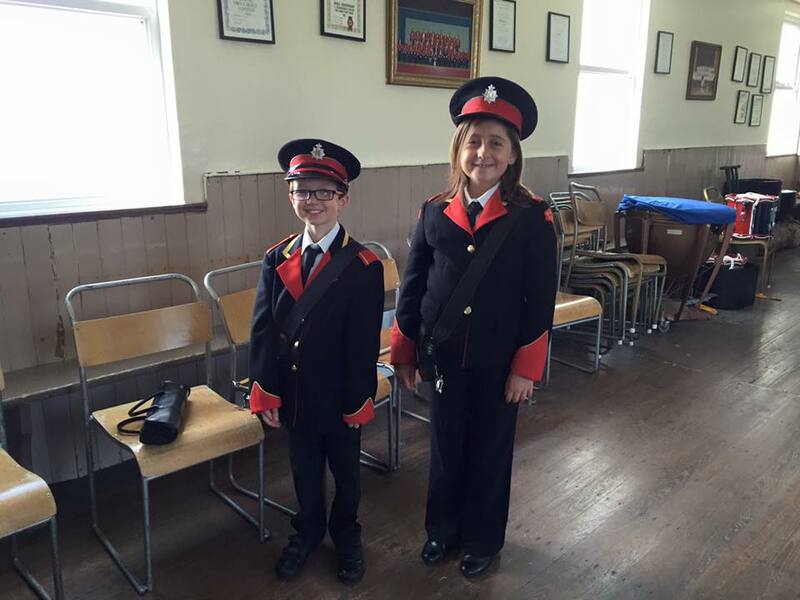 Harry Douglas (right) finished second and Rebecca Thompson third in the Under-13 Concert Section, and Andy Robinson was second in the Novice Side Drum section. Super results - hard work always paid off! 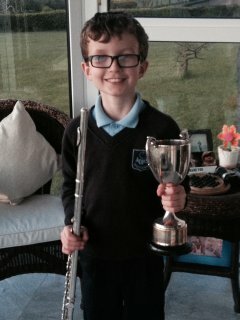 Congratulions to 9-year old Harry Douglas on winning the 2015 Under-10 section of the Flute Band Association’s Solos & Small Ensemble Contest. Harry joins an illustrious group of Ballygowan flute players past and present, who won this trophy in the past; he also finished third in the Under-13 section. 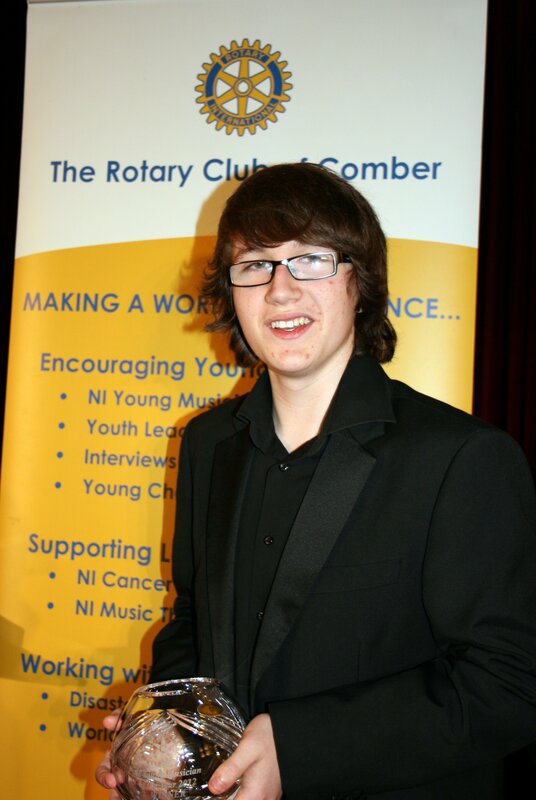 In the impressive surroundings of The Harty Room of Queens University Belfast on Saturday 3rd March, Andrew Douglas won the competition for the title of Northern Ireland Young Musician of the Year 2012. The adjudicator made valuable comments to each of the contestants in turn, and added that in any concert anywhere, they would provide excellent entertainment. In Andrew’s case he said he was most impressed with his phrase shaping and his technique, and he was in charge of the piece at all times. Andrew traveled over to Bournemouth in April to compete in the Instrumental Section of the British Isles version of Rotary Young Musician. The winners of this and of the Vocalists Section will then be invited to play/sing for the delegates at the 2012 Annual Rotary International Britain & Ireland Conference. James Douglas and Benjamin Gourley make their contest debut at the Own Choice in Lisburn on 25 February 2012, and no doubt enjoyed their first win. Nothing like starting with a bang! Congratulations to Andrew Douglas who hightailed it from the Band’s success at the 2012 Own Choice Contest to participate in the Ballymena Music Festival. It proved to be worth the trip as he came away with the prize for the best instrumentalist and a cheque for £300. 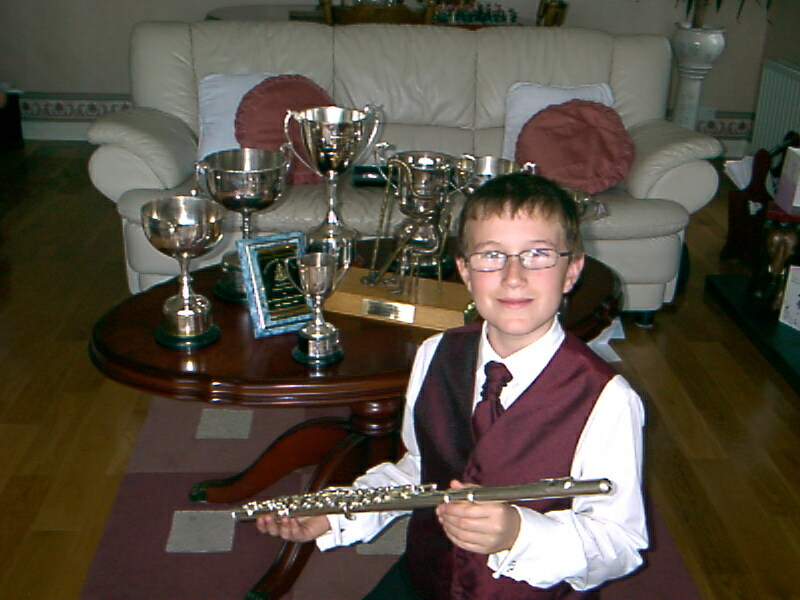 Still only fifteen years of age, Andrew Douglas has now won the best piccolo player prize at the 2011 Flute Band Association’s Own Choice Contest and the Northern Ireland Band Association’s 2011 World Championship for Flute Bands. 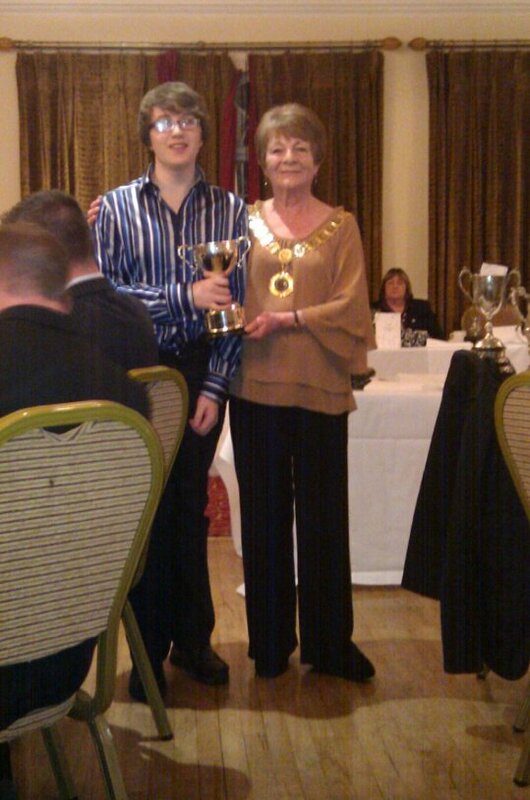 Here, now a sixteen-year-old, Andrew receives the NIBA trophy from President Margaret Campbell. Andrew has also won a £500 share of the Blair Mayne Bursary to help fulfil his musical ambitions - he wants to invest in a new flute - more detail on our members page. 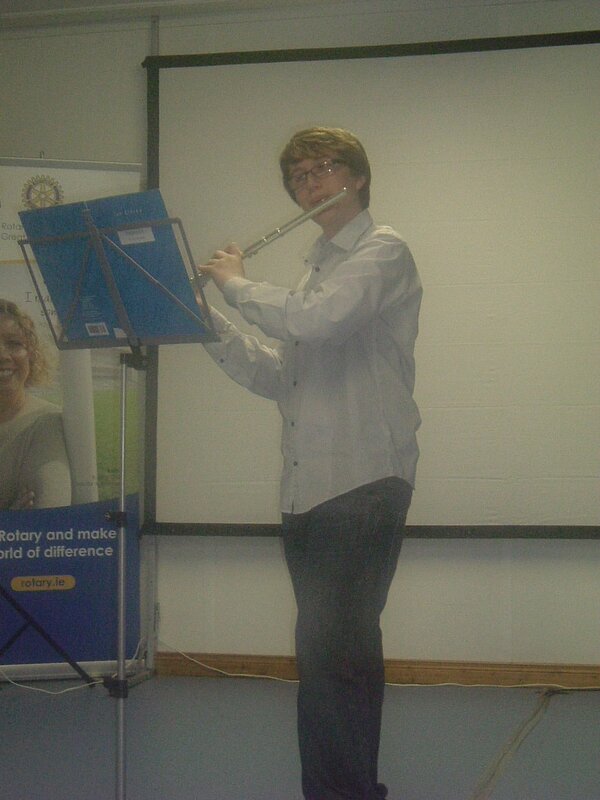 Andrew Douglas entertains the guests at The Rotary Club of Comber’s 25th Anniversary of their Charter. Hannah Mayes captured with her Dad before the annual Orange Church Service in Comber on 10 July 2011. 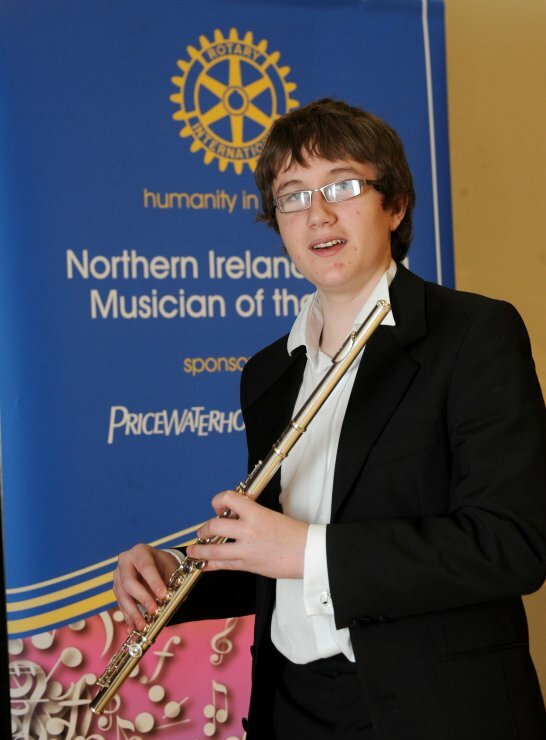 Andrew performs in the 2011 Northern Ireland Young Musician Competition. 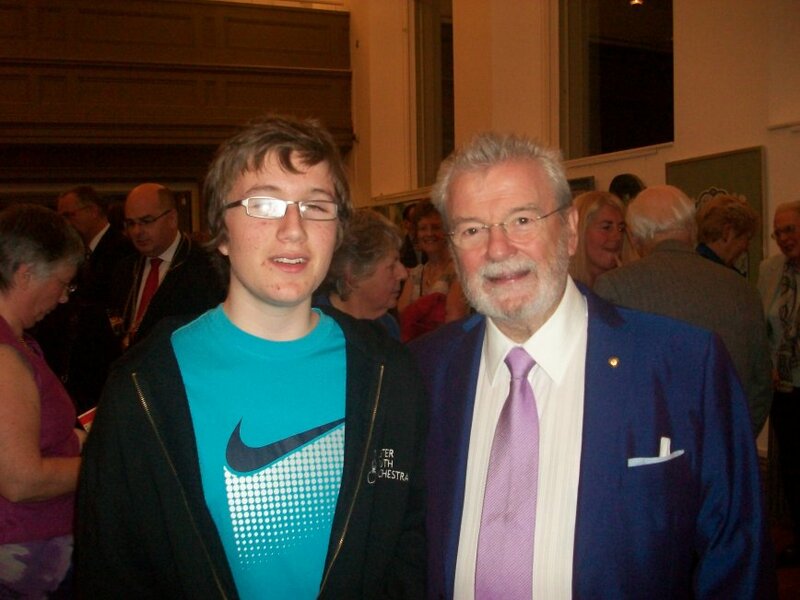 15 September: Andrew Douglas gets to meet Sir James Galway. 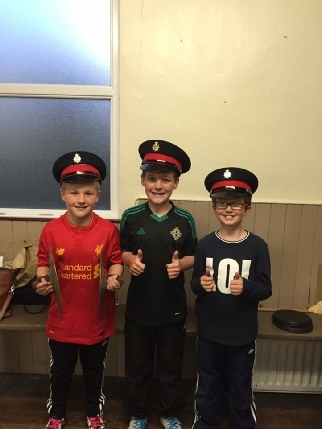 Sir James and Andrew are the only two people at twelve years of age ever to win the Flute Band Association's competition in Under-13, Under-16 and Open Solo in the same year. Less than three years after his treble, Andrew won the piccolo prize at the Flute Band Association's Own Choice Contest. Every year many of our young (and not so young) members enter this competition. There is something for everyone; solos, duets, trios, quartets, sextets, octets not to forget the percussion section. Ballygowan traditionally have a good entry and it can be no accident that successes here throughout the decades by a significant percentage of our members have had a major bearing on the band's development. 1999 photo of Andrew Douglas. These six young people made their first appearance in the Band's colours on the morning of 11 July 2010 at the annual church service for the Orange Brethren of Ballygowan and surrounding district. 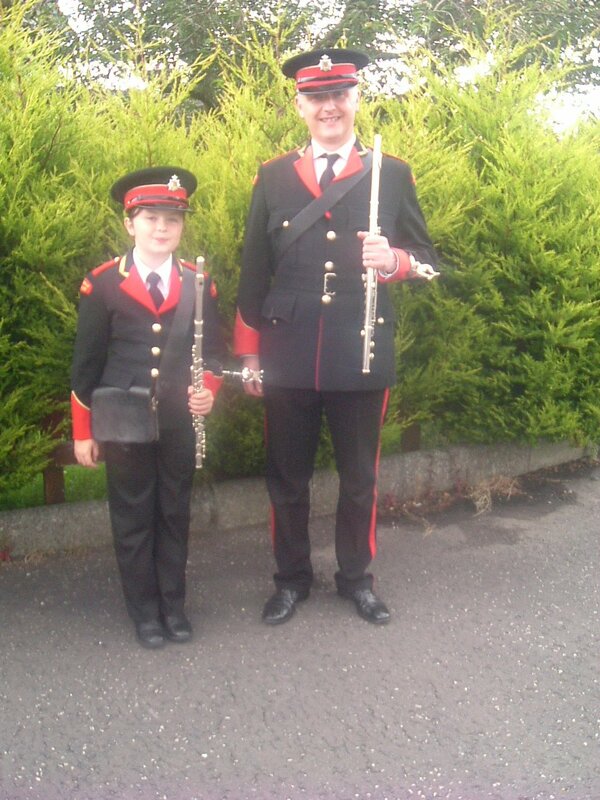 Jonathan Gourley will probably always remember playing in his first major parade on Saturday 29 August 2009 at the Black Preceptory Parade in Crossgar. He had agreed the target with his father (no pressure!) to have learned all his marches to coincide with Dad's birthday - we have it from a reliable source that the flute and marches went on holiday with him to France. Well done Jonathan; you've made the grade! Jonathan would be a direct descendant of one of those pioneers of 1876.